My final day in Chichen Itza culminated in a test of mental control and physical trust. Upon arriving to this beautiful ceynote (a natural swimming hole) I was mesmerized. The colour of the clear and dark blue water, the trees all around and beauty of the cave took me. When I took a look at the way down — a 15ft ladder with no end in sight — fear instantly crept over me. My mind went directly to all of the "what if’s" and the fear threatened the trust of my physical body's capabilities. I quickly realized who was running the show here, and it wasn’t me anymore. It was my mind. Once I caught on, I knew another instant decision to shut that fear and mind chatter down right away. If I wanted to experience the authentic ceynote in that moment while I had the opportunity directly in my power, I would have to change my mental focus, and fully trust my body. The adrenaline was high, and with each step it felt like an action movie packed with anticipation of my every move. Inhale. Exhale. One foot, step. Inhale. Exhale. One hand, two hands — grip. Inhale. Exhale. Repeat. Once down my body finally let me feel it's jittery shake. I landed, I made it to the platform. Then comes the part where I'm not actually a great swimmer so now that I'm spiked with adrenaline I'm wondering how long before I crash… Though as soon as I entered the water all that passed. Water changes you. The feeling was beyond euphoric. Swimming in the middle of a cave with an emerald canopy of trees covering the sky and leaving a heart-shaped opening to the sun felt absolutely amazing. I began exploring the sides, through the hanging vines from the wise old tree-roots. The perfect set-up for climbing. Being able to feel your way around, pulling yourself up and being able to fall back into absorbent thick liquid. I got to practice my slack-lining (on a rope they had situated for assisting swimmers), and float in pure silence. I love floating, I float once a month in a sensory deprivation tank to help clear my energetic field and re-align my being, but this was something else entirely. 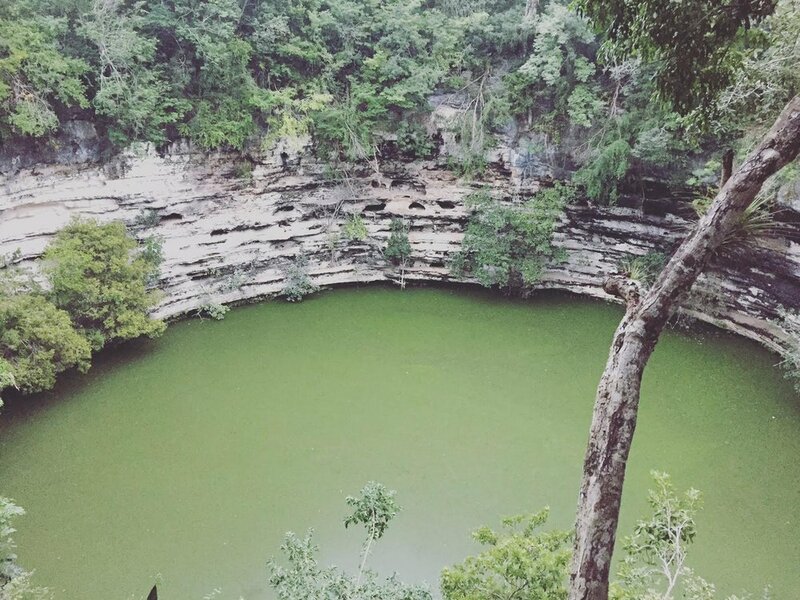 The healing powers of this cenote were magnificent. Once we'd filled ourselves up with as much Gaia healing as possible we slowly began our journey back. Again the fear, less so this time with a heart full of soul and spirit mana. Plus, I had one pass under my belt to prove my mind a good amount of wrong. This time, I was far more aware of the tools available to me, and I had just spent a good 30 minutes being really physical, further activating trust in my body, calming my mind, and practicing their balancing act. I felt my heart beating now with a steadfast strength, ease, and surrender. You know, that powerful place when fear can’t hold our hearts. So up I went, this time noticing though that my physical body was weaker than I'm used to (not being home and in my daily physical practices), and that I was experiencing a bit of fatigue. Another reason for my mind to engage fear and step in, "You're too tired. Now you'll really slip and not be able to hold yourself up." Again, I silenced it. The heart, I nurtured her. Breath in. Breath out. Movement. Breath in. Breath out. Stillness. Finally, I made it out fully alive and incredibly invigorated. Thanks to adrenaline and the healing properties of this special place, I took a video right away because I wanted to remember this feeling, the story, and the journey. I wanted to be able to learn spiritually from this challenge and find a way to share. It was a very clear play-by-play of how your mind can easily engage its pattern of fear, even when your body is super capable. Physical intelligence can be something that we forget to give enough credit. This was an experience for me that lands home all the more importance and value of keeping up my challenging physical practices, as they challenge my mental framework also. The two I’m learning, often work hand in hand. But one thing’s for sure, and something that in this present time and day no matter what challenges are coming your way. Fear is showing up in all of the pockets of our world right now. And even though it seems as though there’s nothing that can be done, or your mind wants to trick you into being stagnant, wanting to hide and never come out. We have to remember that Fear Can’t Hold Our Hearts. If it’s something we truly care about experiencing, or sharing, or being, standing for, or creating…then our heart knows how to use the powerful alchemy of strength, courage, ease, and surrender to get you there. Let your heart, soul & spirit be your guides. Free your mind.